A new bus to be run by voluntary organisation Gala Wheels has been named ‘Curly’ after one of the service’s biggest fans. It’s the nickname of Al Stewart, who used the service – which enables wheelchair-bound and otherwise vulnerable people get to health appointments and social functions – until his death earlier this year. Christine Grahame and Christina McKelvie (inside the bus) are joined by volunteer drivers and funding partners of the scheme. And now, his wife Margaret, who still uses the service, has donated an extra £4,000 to the service, to go along with the £4,000 already donated by their son Alan, who lives in Selkirk. Now Alan has called on more Borderers to help out. He said: “Gala Wheels helps people to travel and stay involved. Your parents and grandparents use this local service and I would like to appeal to you to give a little to help Gala Wheels and ask you to give what you can towards maintaining the freedon of the elderly and disabled in the area. Benefactor Alan Stewart with the new bus named after his father, and executive officer of the Bridge, Morag Walker. Gala Wheels is operated by The Bridge, a community development organisation, and relies on a small army of volunteer drivers. The £34,000 for the new bus was raised through funding applications as well as private donations. The Hayward Sanderson Trust gave £10,000 and another £10,000 was received from the lottery. 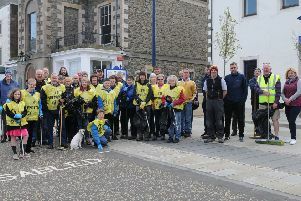 There was also a community grant from Scottish Borders Council. Morag Walker, executive officer of the Bridge, said: “It’s invaluable for our service users, and to maintain the service for the socially-isolated and vulnerable people in our community, so that they can maintain that social connection. Getting the bigger vehicle has been absolutely fantastic for us. We have been fundraising for some time, while turning business away. The three buses at Gala Wheels' disposal. At the launch of the new bus were the Scottish Government’s newly-appointed minister for older people and equalities. Christina McKelvie, and local MSP Christine Grahame. Ms McKelvie applauded the scheme, saying: “Community-based project such as this one are abolutely key in delivering the aspects of aleviating social isolation and loneliness, which the Scottish Government is tackling right now. “You may think that a small project like this isn’t a big thing in the grand scheme of things, but it is actually key to maintaining those connections that people should have with their communities. Ms Grahame told us: “I’m delighted that the minister has come down to the Borders to find out how much local communities can do for their older people.